I have been reminded by a few people that I have been negligent in my blogging duties, but I have been BUSY! In addition to the regular duties of being a mom and working full time, I have been traveling a lot for work and had to finish up a statistics class. Statistics does not come easy to me so the final involved much studying and panicking. Plus, the house is at a fairly non-interesting stage. We did have some excitement when the pillars were put back on the front porch, but the past few weeks have just involved mudding and sanding drywall. 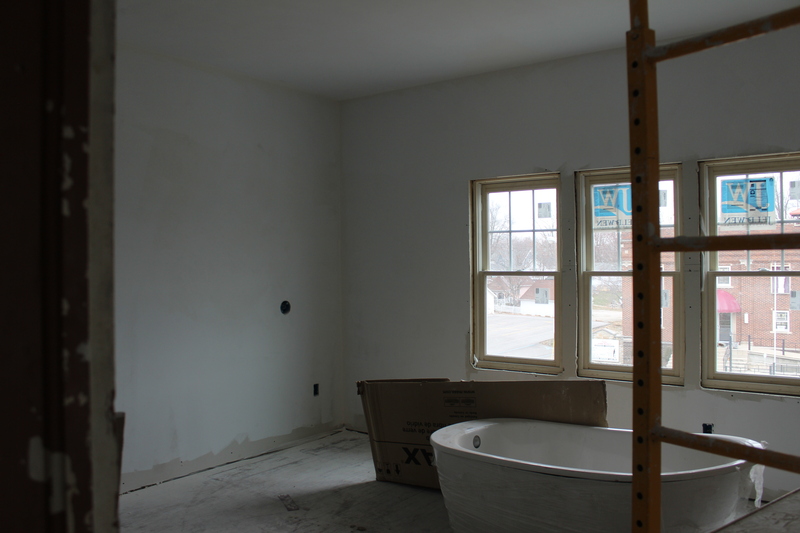 Unfortunately, all that work doesn’t really look any different from the way the drywall looked when it went up. However, the drywall downstairs, and on most of the second floor, is ready to paint so last weekend and this weekend were spent painting. 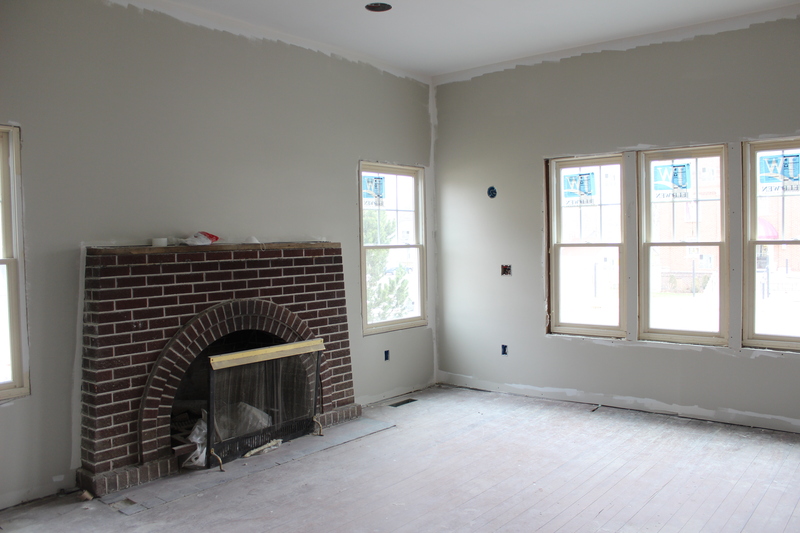 Most of the finished walls now have a coat of white primer on them. 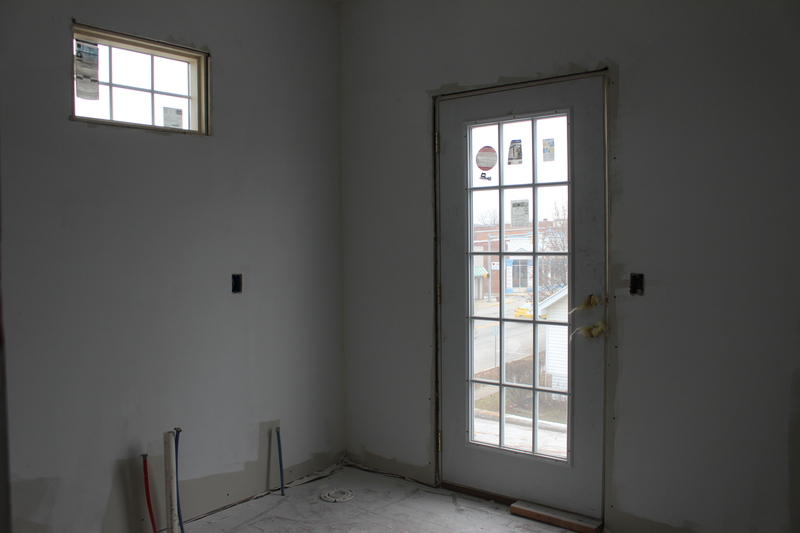 Here are the master bedroom (currently housing the bathtub for the hall bath) and the master bedroom bath with the new door leading out to the porch roof. I can tell you that rooms with 10 foot ceilings are a bear to paint. For the color in the living room I went with Revere Pewter by Benjamin Moore, voted the best paint color by several blogs whose names I cannot remember. These blogs claimed it was the best neutral ever and it matches everything. After looking at a zillion little paint samples, I decided real professional decorators probably know far more about picking paint colors than non-profit administrators. I discovered that you can buy Benjamin Moore paint at the Connelly’s Do It Best on Dupont where there is never a line at the paint counter and they put all of your info in the computer so you don’t even need to remember your paint color when you come in for more! Amazing. Clearly created for people like me who can never remember what paint colors they chose. When I was waiting for the paint to mix, the woman working at the paint counter asked me about my project. As soon as I told her I was renovating an old house on Main Street in Churubusco, she said, “The big house with the pillars and wrap around porch? 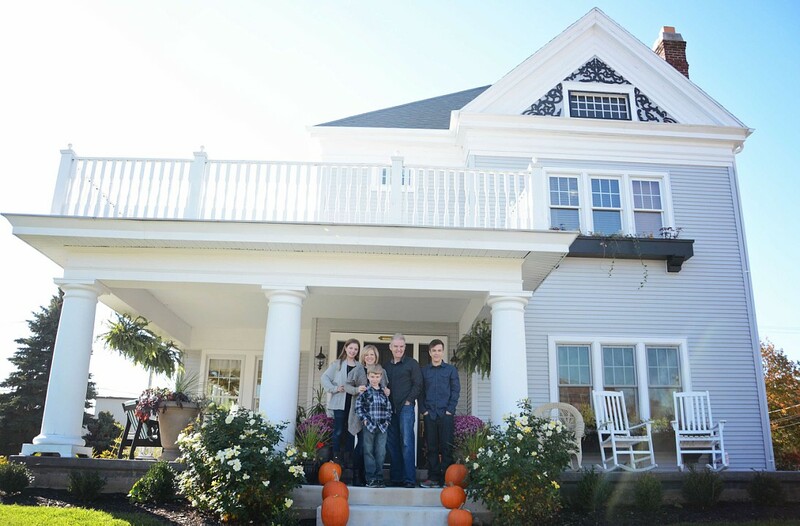 I love that house!” Turns put she drives through Churubusco regularly and has been watching the progress of the renovation. She told me that years ago she gave a ride home to a woman who lived in the house and she was dying to ask her if she could come inside and look around. Another name to add to the invite list for the open house…. After two straight days of painting and climbing up and down scaffolding, every muscle in my body hurts. Every. Single. One. I am covered head to toe in primer and Revere Pewter. On the plus side, I match everything now. This entry was tagged benjaminmoore, Do It Best, Drywall, Home improvement, old house, Paint, renovation, Revere Pewter. Bookmark the permalink.